Get far away from the noise of honks and smoke of cars into the music of nature and stand amidst clouds. Soak in peace and tranquility in the unmatched splendors of North East India. Discover the lush green mountains, serene lakes, enticing monasteries and spectacular tea gardens in this unmatched nature’s wonder. While Gangtok offers magical views of Mt. 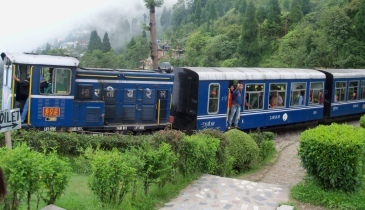 Kanchenjunga and rich culture, Darjeeling provides spectacular tea gardens and peaceful ambience. Surcharges Extra (if applicable) on Long Weekends & Holidays. On arrival at Bagdogra Airport, our local tour representative will meet you at the specified area and transfer you to Gangtok (135 kms, approx. 4 hours drive). On arrival, check in at hotel and catch an early sleep tonight. Wake up to witness the awe striking natural beauty and charge yourself with morning breakfast. Today set out to cover breathtaking sights of Gangtok. 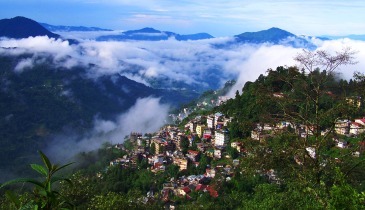 Surrounded by monasteries and orchids, Gangtok is truly a traveller’s delight. Visit Hanuman Talk, Ganesh Tok and Tashi View Points. Further, proceed to the seven best offerings of the city being Jhakri Water Falls, Directorate of Handicrafts and Handlooms (Closed on Sunday), Cable Car (Own Ticket), Research Institute of Tibetology (Closed on Sunday), Do-Dul-Chorten (Stupa), Flower show & Enchey Monastery. After local sightseeing, the evening is free for your own leisure and local shopping. Today morning take a fill at morning breakfast. Today we’ll go for a day excursion to Tsomgo Lake (Timing will depend on the issuance of Permit). Situated at a height of 12,400 feet and an average depth of 50 ft, the lake offers serene and breathtaking beauty with sparkling blue water. Being on such a height, it is highly advisable to carry heavy woollens with you. It is about 45 kms away and takes approx. 3 hours to reach. Tsomgo/Tshangu/Changu Lake is regarded as a very sacred lake by local Buddhists and Hindus. The lake keeps frozen from winters to mid May. You can enjoy a yak ride here (on your own expense). Just on the lake side, visit the Baba Mandir, temple of Lord Shiva built in memory of sepoy Harbhajan Singh. Primula flowers and other alpine plantation provide an immaculate beauty to this place. Later return back to hotel in Gangtok and retire in your cozy bed for a relaxed sleep. Today morning after breakfast, check out from the hotel and drive to Darjeeling, one of the most beautiful and tranquil hill resorts of India. At an altitude of over 2100 m, ‘Dorje Ling’, the place of thunderbolt offers breathtaking vistas of Mt. Kanchenjunga and other snow peaks. Bein about 100 kms away, it takes approx. 4 hours to reach. On arrival, check in at hotel and relax. Later, step out to explore the nearby areas and witness the alluring landscapes. See its tiny waterfalls, little quaint villages, and the famous old railway track. 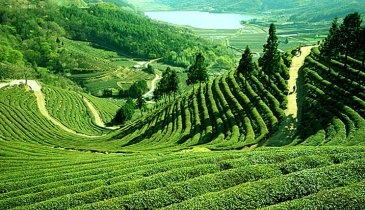 Capture the sunset views of the snow capped mountains and enjoy a relaxed stroll in the world famous tea gardens. Return to hotel and catch an early sleep as you are required to wake up very early next morning. Today early morning at 3.30 AM, step out to visit Tiger Hill, the famous spot to witness a breathtaking sunrise with amazing colour effects on Mt. Kanchendzonga, world’s third highest peak. When the whole range of snow peaks turns its colour to gold, it is a majestic sight to behold. (Note: The view you get depends totally on the weather on that day.) Later visit Ghoom Monastery, the oldest in the area built in 1875 and Batasia Loop while returning back to the hotel. Have a fill at morning breakfast at hotel and later proceed to visit Darjeeling’s famous 7 points of interest. It includes the Zoological Park & Himalayan Mountaineering Institute (both closed on Thursday). The institute was started by Tenzing Norgay after he returned from successfully climbing the Mt. Everest. Also visit the Tenzing Rock, Tibetan Self Help Refugee Centre (closed on Sunday), Tea Estate (Panoramic view), Japanese Temple & Peace Pagoda. Rest of the evening is at leisure. You can explore the local markets in this time and later return to hotel for a relaxed sleep. Please note this Boat cruise is an outsourced facility and the hotel has no control on the profile and behavior of fellow passengers on board, moreover the hotel is not responsible for the safety and security of the in-house guests availing the same.